Creamy, garlic, spuds, what’s not to love? I live in an area that is well known for its spud growers. We get a fresh bag every week from a local farmer. 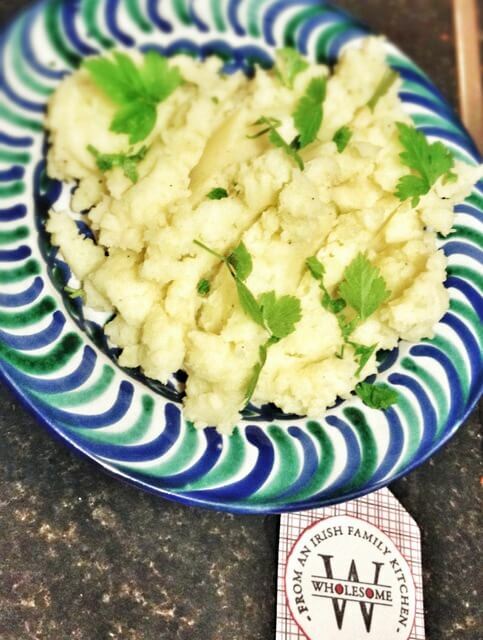 This is a heavenly combination of local potatoes, garlic & parsley from our garden, full fat Irish milk and golden Irish butter. This is not a calorie counting type of dish but it’s filling and easily prepared in advance. We have this at least once a week as part of our main meal. Put your potatoes into a large saucepan and cover with cold water. Place on the heat and bring to a simmer. Cook on the heat until you can poke a fork into each potato with ease. Leaving the hob on low, drain the cooked potatoes into a colander and put into the bowl. Return the same saucepan, there is no need to clean it, to the hob and put the butter and mashed garlic into the saucepan to cook. This stops the garlic from being too harsh and pungent in the mash. Mash the potatoes. *note* I use a fork to mash my spuds, but a masher is fine. I just find that a fork, while it can be a bit of hard work, gives a fluffier result. Add the milk to the saucepan slowly, so it doesn’t splash up on you. Then bring to almost simmering point. If your milk starts to boil, don’t panic. Just move the pot away from the direct heat. Once the milk is at simmering point carefully pour it over your mashed potatoes and stir with the spoon. The reason why you heat the milk is because the hot milk reacts with the potato and makes it very creamy. If you were to pour cold milk over the spuds at this point it wouldn’t be as smooth. Return the potato mixture to the saucepan and put it back onto the heat. Keep on stirring, put a bit of welly into it, and the mixture will thicken further. Once your mash has the consistency you like then serve garnished with parsley. Or if preparing in advance transfer it to a heatproof oven dish, cover with tinfoil and keep in the oven until you want to heat it. Another winner, Catriona! 🙂 Deliciousness as a lovely accompaniment to the main dish. I didn’t have parsley so I used Italian Basil instead, and it it was lovely; next time, the parsely 🙂 I really appreciate how simple, easy to put together and just plain scrummy your recipes are! Really? Maybe I could give you some tips, if it’s something you’d really like to try; what happens when you try to grow it, Catriona.